Spurred on by Ernst Udet's enthusiastic reports on what he'd seen during his tour of the United States, the Luftfahrtkomissariat's C‑AMT let design contracts to Fiesler and Henschel for prototypes of Sturzkampffleug­zeugen, or dive bomber. In February 1934, a requirement was published for the aircraft and tenders were awarded to Hamburger Flugzeugbau GmbH, Fieseler Aircraft GmbH and Henschel Aircraft GmbH. 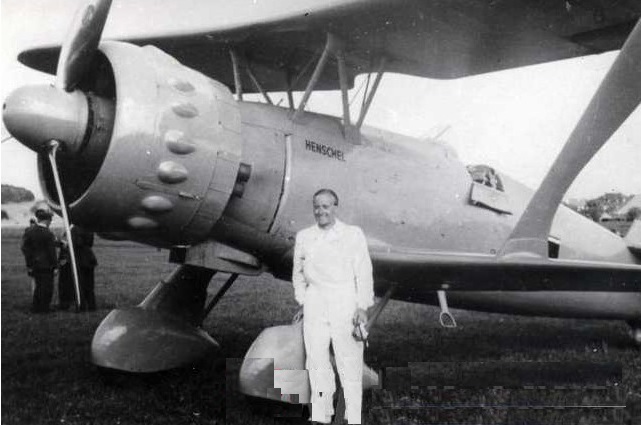 Henschel chief designer Friedrich Nicolaus developed a sesquiplane with an open cockpit and fixed landing gear of all-metal construction. The power was a BMW 132 enclosed in a NACA ring. The wings had the usual control surfaces and they were partially covered with fabric. The control surfaces were all covered with fabric. The construction of the prototype progressed rapidly and on 1 April 1935, the Hs 123 V1 was completed. 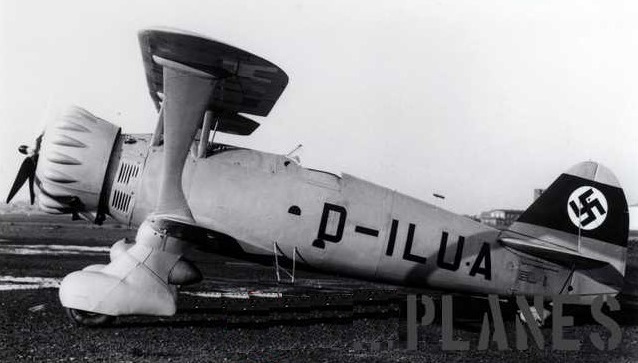 Maiden flight was on April 5, 1935 and Hs 123 V1 had the registration D-ILUA. The V2 was tested with a Wright Cyclone R-1820 F52, starting with 770 hp power. This machine suffered from a landing accident and later was adapted to use the BMW 132 A and in this configuration was designated as Hs 123 V8. The testing of the three machines from different manufacturers was held at Rechlin from June 1935 up to January 1936. Henschel's Hs 123, flown by Udet himself, comfortably beat out its competition, the Fi 98, but two prototypes were lost in quick succession once flight testing had begun at Erprobungsstelle Rechlin. 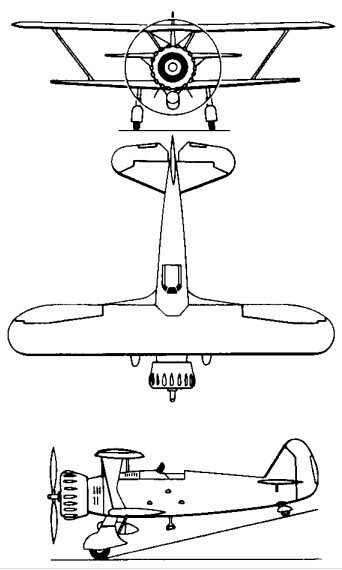 Examination of the wreckage and static testing of the surviving ariplane pointed to weakness in the top wing's center-section, the design being modified accordingly. The Henschel Hs 123 was found as most suitable from all proposed aircraft and production began in 1936 at Kassel. The Hs 123 V5 was presented in 1937 at the International Air Meeting in Dübendorf. The very first production block was Hs 123A-0, delivered to units in 1936 and the main purpose for these machines was operational testing by the Luftwaffe. The first series-manufacture example was the Hs 123A-1 and these had minor differences compared with the previous pre-production block. 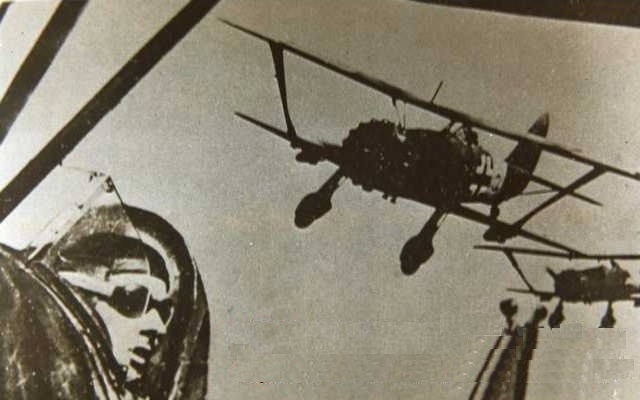 The aircraft was equipped with pilot armor. The main offensive armament was four SC50 bombs mounted on the bottom wing racks with optional SC250 bomb mounted beneath the fuselage. On the fuselage central position it was also possible to mount a droppable fuel tank. Two MG 17 machine guns, caliber 7.92 mm, were mounted in the top nose and they were synchronized to fire through the propeller arc. Hs 123A‑1s first entered service with Stukagruppe I/162 Immelmann, examples soon being sent off to Spain where they were flown by "volunteers" from the Legion Condor, proving their worth by providing close support for Nationalist ground forces. The Spanish Air Force later received the remaining Hs 123 A-1. These Hs 123 were based in Seville and during the combat evaluation Hs 123 performed at a high efficiency in the close-support missions, and at the same time performed as a safe combat platform for its pilots. By 1939, despite its success in Spain, the Luftwaffe considered the Hs 123 obsolete and most of the Schlachtgeschwader equipped with the type had been disbanded and only II. (Schl)/LG2 remained operational with the Hs 123. Sole operational II. (Schl)/LG 2 had 39 machines which were engaged in combat missions during the Polish Campaign. This single unit proved to be particularly effective and this is greatly dedicated to the sound of the engine which had a psychological effect on ground forces. It was also true that the Hs 123 could take considerable punishment and stay flyable. One of the benefits was use from unprepared airfields. After this good combat record, the Hs 123 was put into the combat missions over the Low Countries and France. At this time the Luftwaffe had two operational combat aircraft, the Junkers Ju 87 was a dive bomber and the only machine that could give close support was the Hs 123, previously declared by the Luftwaffe as ’obsolete’. After the campaign in France some number of machines was sent to 10. (Schl)/LG 2. and they were seriously considered to be used during Operation Barbarossa. In the begining of Operation Barbarossa, the single Gruppe of the Luftwaffe that was providing ground support was II. (Schl)/LG 2, equipped with 38 Bf 109Es and 22 Hs 123s. During the operations the Bf109 was shown vulnerable during operations with weak landing gear as well as a sensitive engine to ground fire and Hs 123 again showed some advantage as a close support aircraft. The Escuadrilla Azul, volunteers from Spain flew the type during this time. Bitter experience came in the winter 1941/42 since the open cockpit was not good accommodation for pilots in harsh winter climate. From January 1942, the unit was re-designated as SchlG 1 and Hs 123 became a part of 7./SchlG 1. SchlG 1 took part in the operations in Crimea, Battle of Kharkov and in the Battle of Stalingrad. The Hs 123 was then being replaced with modern aircraft. The remaining machines were sent to the trainer units as well as in non-operational occupied zones. China imported 12 Hs 123 A-0 from Germany before the war, those aircraft only saw limited actions in the Chinese air force, after new aircraft from the Soviets arrived in China after 1938, those survived German war planes were transferred to reserve. Germany stopped military supply to China in May 1938 and the Hs 123s suffered from shortages of spare parts and they saw limited service. Operated by 15th Sq of the Chinese air force, the few Hs 123 were used in the dive bombing role against Japanese shipping on the Yangtze River in 1938. Although scheduled to be phased out in favor of Junker's Ju 87 the Hs 123 did its ground‑attack job so well that General Wolfram von Richthofen recommended, in 1943, that it be put back into production. Whatever the idea's worth it could not be followed up on, since all tooling and jigs had been broken up for scrap three years earlier. Last samples of the Henschel Hs 123 remained operational until the spring 1944 when 7./SG 1 replaced their last Hs 123s with the Ju 87. By 1945, the Hs 123s that remained serviceable were reassigned to secondary duties such as supply dropping and glider towing. During its service the Hs 123 had just a few operational camouflage patterns. First one was splinter with RLM 61, 62 and 63 at the topside and RLM 65 at the bottom. There were two variations of this scheme used. During the later service this camouflage pattern was still used no matter that it was officially discarded and during overpainting the aircraft got single colour of RLM 71 or 70 at the topside.